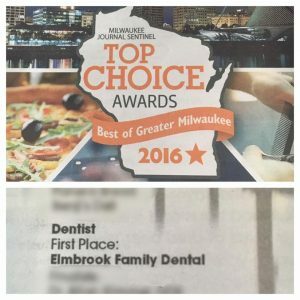 Perhaps you have heard the buzz already, but for those of you who haven’t heard, Elmbrook Family Dental was voted the best dentist in the Greater Milwaukee area by our own patients. You, as readers of the Milwaukee Journal Sentinel voted and helped us take first place! Words cannot describe how honored we are that people took the time to vote and spread the word about our office. We have been so blessed to grow our patient base over the years. Dr Brunner, Dr Taibl, Dr Tack and Dr McGinn take pride in caring for all of our patients dental needs. Some of you who have been a part of our practice for over 20 years! You continue to trust us and refer your family and friends to our office. We are so thankful for all of you and the confidence you have in us.